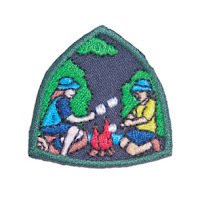 I've been wanting a place to put my Girl Guide planning on-line, so that the work I've put into planning can be used by other Guiders. Life is easier when we share! Our meetings are 2 hours long. We start with 30 minutes of Patrol time, followed by Horseshoe and about 75 minutes of programming. 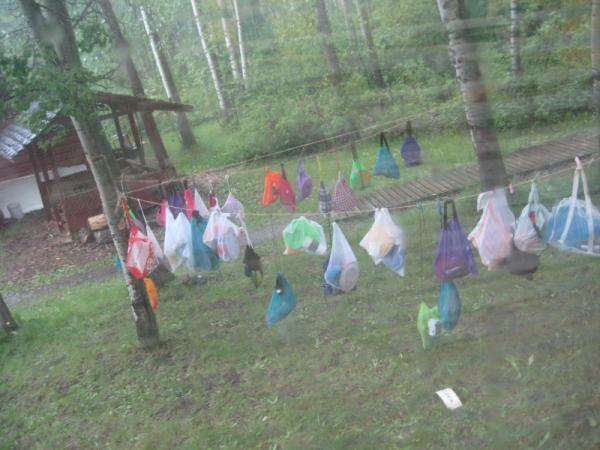 After the permission slips and kit list went out, @Jenn_Boot posted﻿ this picture showing dishes in mesh bags drying on a line, and I thought it was a perfect illustration to our parents as to why we ask for dishes in mesh bags at camp. So I sent an email to them, showing them this picture and giving them a link to the 64th Guides blog post on How to Pack for Camp. We have a number of first year Guides who have never been tent camping and I wanted to ensure the parents knew that there were reasons for everything we put on the kit list. I kept a close eye on the weather all week, and no matter how many times I looked at it, there was going to be rain on Saturday, and we most likely wouldn't be putting the tents away dry. But there's no point cancelling because the food and supplies are already bought, and as long as you're dressed properly, the rain shouldn't be a problem. Our Quartermaster had a great idea for packing her van with supplies--cookies boxes! Each box was filled with supplies for each activity and marked on the outside so it could be found easily. They stacked up neatly for transport and we could use them for the campfire when we were done! I need supplies for box ovens? Pull out the box and inside is wide, heavy duty tin foil, duct tape and scissors, empty pop cans, foil pie plates, and grills! It was very handy and organized. 6:30 Arrival--Most years, we scramble to get the tents up as everyone is arriving and it's total chaos, because that's the way it's been done in the past. This year, I thought it through and it's not like it's getting dark soon after we arrive. We have time to have orientation, get the girls organized into tent patrols, and then have them set up their own individual tents. I wanted to get my tent set up first though. I arrived early, and started peacefully setting up my tent by myself. It was going well at first, but then I put one of the wrong poles in. I pulled it out, and then another Guider arrived and I was talking to her as I put the pole back in, and didn't I put the exact same wrong one in! So frustrating! But I did eventually get the tent put up properly. As the girls were arriving, the parents weren't leaving, so one of the Guiders gathered all the girls and took them to the far end of the campsite and played Stella Ella Ola with them, trying to give the parents the hint! 7:15 Orientation (BC#4, BC#5, BC#9)--I can never remember everything, so I printed out the Safe Guide Tenting in Established Campground. 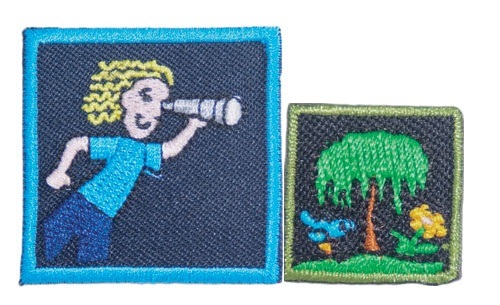 We handed out Camp Challenge Booklets, which I found on the Canadian Guider blog. For each activity that they completed, they could earn a bead. We thought about giving them strings to tie the beads to, but we ended up giving them little mesh bags to store them in that they could pin to their hats if they wanted. We also gave them little pouches from the Dollar Store that hung around the neck, and in the pouch was a pencil, a pen, a notebook, and their mesh bag for beads. This way, they would have all the tools they needed to work on their challenge books when they wanted. Sixties Party is one of those songs that's really fun to sing and teach, but be careful, because the girls loved it and if we heard it once, we must have heard it 60 times over the course of the weekend! For mug-up we made nachos in the fire. We had small tin foil pans (one per girl) and put tortilla chips and cheese in them and covered them in foil and threw them on the hot coals to melt the cheese. Then our Quartermaster passed out salsa and sour cream to go with it, and everyone loved the snack! 10:30 After campfire, we dug a spit pit for teeth brushing and then got the girls ready for bed. We reminded them to change EVERYTHING, head to toe, before bed. There's no way to guarantee that they listen to us, but we stress it every year! Within 5 minutes of everyone being in the tents, we heard our racoon friend banging into the garbage can, looking through tin foil scraps for food. One of these years, we'll remember to weigh down the garbage can lid on the first night! 7:00 Wake up! The girls were to get dressed and roll up their sleeping bags before coming out to get breakfast ready. Though it wasn't raining yet, we were expecting rain for the day so we strung up a tarp and poles to extend our dining shelter/kitchen, to give the girls somewhere to cook and stay dry. The girls made pancakes and bacon for breakfast. Each stove only had one frying pan, so they cooked the bacon first, and then each girl cooked her own pancake. In the Challenge Booklet, the girls could eat with chopsticks (found at the Dollar Store) or blindfolded (we brought scarves for them). Of course, some girls went with both options! Program--We had planned to have four stations that they could rotate through, but with the rain, we realized we really only had 2 good dry spots for teaching and learning. It made the groups bigger for teaching, which isn't always ideal, but we seemed to manage okay. One group went under the tarp on one side of the dining shelter and the other group went under the alcove of trees on the other side of the dining shelter. She also showed them how to make and use fire starters, though they didn't make them themselves. One that was new to me was a cotton make-up remover pad dipped in paraffin wax. To use it, you rip it and then light it on fire. She gave one to each of them to put in their Be Prepared kits. 11:00: One Station--either Clothing or Box Ovens. While we were doing these stations, the compass Guiders were setting up 5 compass courses for the girls to do later. 11:30: Snack: Smores to go--Baggies with Golden Grahams cereal, Teddy Grahams, chocolate chips, and marshmallows. Since it was raining and cool, they also got hot chocolate to go with it. Some of the girls had the idea to put their marshmallows into their hot chocolate--good idea! Then they put their chocolate chips in too--bad idea! We wanted a quick clean-up of the mugs, but the chocolate chips stuck to the bottom. 2:30: Free time after lunch clean up. I also handed out folders to them, which contained information on how to plan a campfire, and a list of songs that we've sung (the index and table of contents to my personal song book that I created of songs I know and love). They had a planning sheet and they could plan their campfires during free time and we would give them a warning when they had 15 minutes left and had to plan. 5:15: Free time The girls could come to us during free time to get credit for their Challenge Booklets and collect their beads. After supper, they got to decorate and eat their cupcakes. There was vanilla icing, and chocolate icing, and sprinkles! 7:00 Wake up time again! We woke up to rain again, but it stopped fairly soon after we got up. Not enough that we were going to be able to get the tents dry before we packed up though. 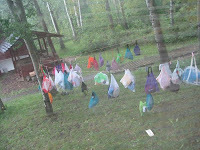 The girls had to get dressed and packed up and move their gear out of the tents before they could come to breakfast. 8:00 Breakfast--easy breakfast for Sunday morning. Cereal cups with milk, strawberry pop tarts, and fruit. When they finished eating, they were to take their dishes and pack them away too. Parents started arriving around 11, though pick up wasn't until 11:30. It was a great camp, and the girls were awesome. We didn't have any complaints about being wet, almost all of the girls came properly dressed in rain boots and coats. As Guiders, we boggled at the parents who would send their daughters for a weekend of outdoor camping with no indoor shelter, and still not provide them with the proper gear. We covered a lot of program, though we probably scheduled a bit too much into the weekend. We didn't have a lot of down time, but then again, the girls didn't complain about that either. We didn't get a lot of requests for "When's Free Time? ", which I guess is a good indication that they were enjoying what we were doing with them. I'm starting my 19th year in Guiding--seven years as a girl member, and now I'm entering my twelfth year as a Guide Leader. I love to do challenges and earn crests and patches, and try to tie as much as possible to the Program Squares. As a unit, we work hard to cover all the Program Squares in a three-year time period, to help our Guides earn their Lady Baden-Powell awards. I do all my researching and planning on-line. It's always nice to find what other Guiders are doing with their girls, to get ideas and expand my horizons!